***This article originally appeared on GlobalVoices.org and is also available in French, Spanish, Malagasy, Italian, and Japanese. 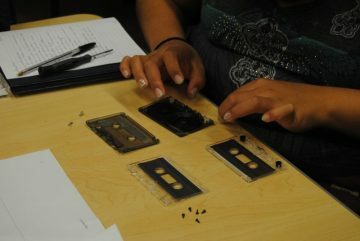 Audio cassette digitization workshop. Photo provided by the UBC Library. While not quite obsolete, audio cassettes are losing their appeal as long-term storage solutions of sound recordings. Many First Nations communities across British Columbia, Canada, are in possession of hundreds of cassette tapes filled with hours and hours of audio recordings of elder stories, traditional songs, and other key elements of their culture. Given this shift away from the analog technology, they are concerned that much of this knowledge may be lost if they don’t come up with strategies to transfer their contents to digital formats. A project called Indigitization has stepped in to providing funding and training for these First Nations communities to digitize those recordings as a way to preserve them for future generations. This collaborative project between the Irving K. Barber Learning Centre, the First Nations Technology Council, and three First Nations communities — Heiltsuk, Ktunaxa, and ‘Namgis — created an online toolkit with step-by-step instructions for communities interested in undertaking the digitization process. Among the sections contained in the toolkit include digitization best practices and standards, instructions on adding metadata, as well as additional tips on digitizating photographs and maps. Indigitization logo created by Alison O. Bremner, a Tlingit artist. The project also put on a “Futures Forum” conference held in June 2016, which “brought together an emerging network of community-based information professionals and practitioners, academics, and a wider community of specialists who work to support context-appropriate information practices within Indigenous communities.” A summary of the panels and speakers can be found in the Stories from the Forum section.